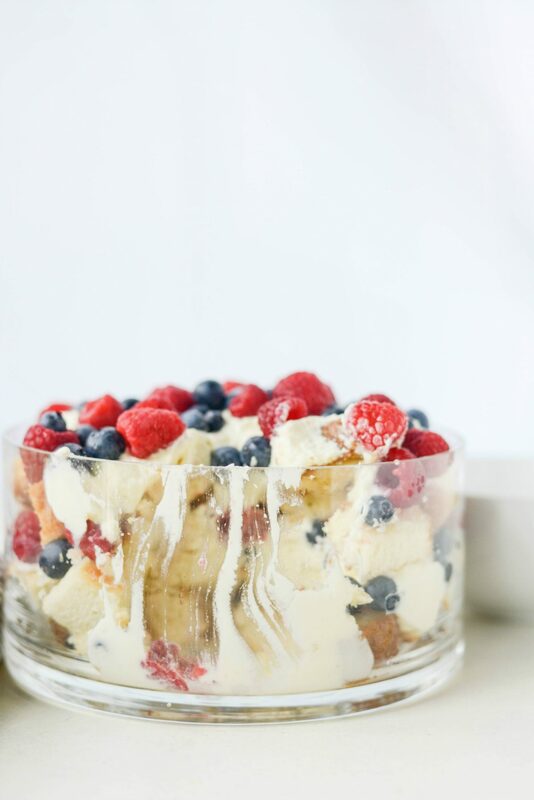 What dessert is more patriotic than this Red, White & Blue Trifle? 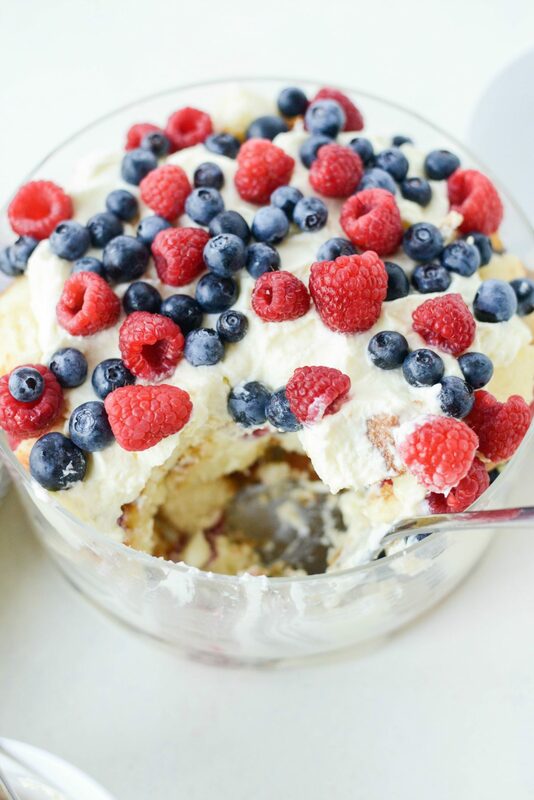 Okay so maybe a flag cake, but this dessert has homemade pound cake, brushed with a simple lemon syrup, cubed and then layered with fresh raspberries and blueberries and a fluffy mascarpone whip! 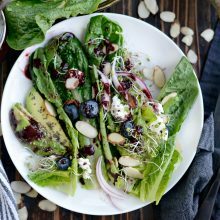 Decadent yet light and bursting with freshness. 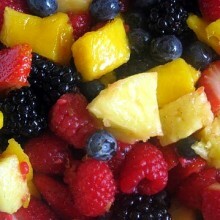 Serve this at your 4th of July get-together! 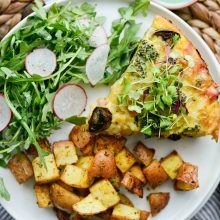 Did I really just post four recipes in 4 days? I did. 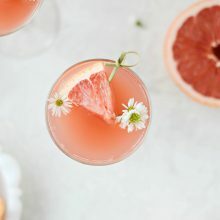 The 4th of July is approaching at lightening speed and I wanted you to get these spectacular recipes sooner than later, and definitely before the fireworks go off. My kitchen has been a disaster for the last week and I’m not mad about it. I’m also starting to feel like a broken record. If I type the word easy or simple one more time… But alas, I have yet another easy, throw-together-kind-of-recipe. 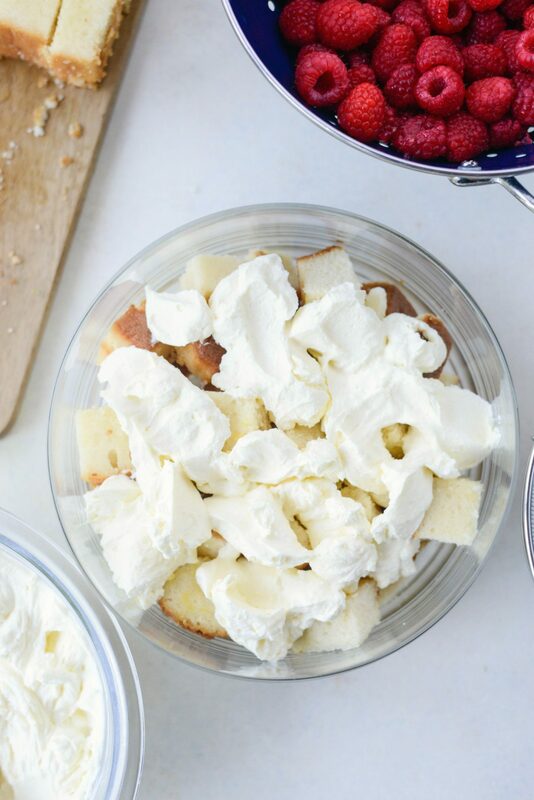 Sure it requires making pound cake (I made half this recipe and baked it into smaller loaves) but once that’s out of the way (and you could even use store-bought and make this dessert that much more simple <—there I go again) it only takes about 30 minutes to throw this trifle together. Trifles aren’t typically my thing. 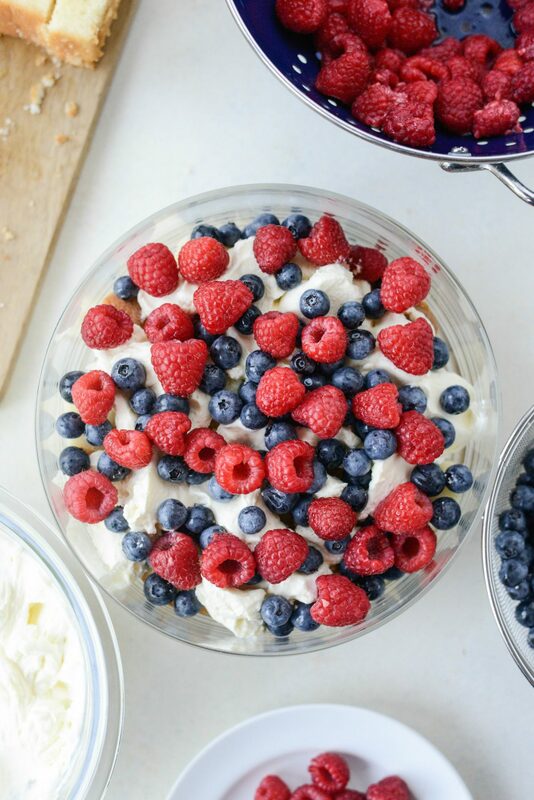 My husband’s family usually has a brownie-slash-pudding-slash-whipped-cream trifle that graces the dessert table on the 4th of July and that got me thinking about a more patriotic version. You guessed it, a red, white and blue version. The red and blue was simple; berries. 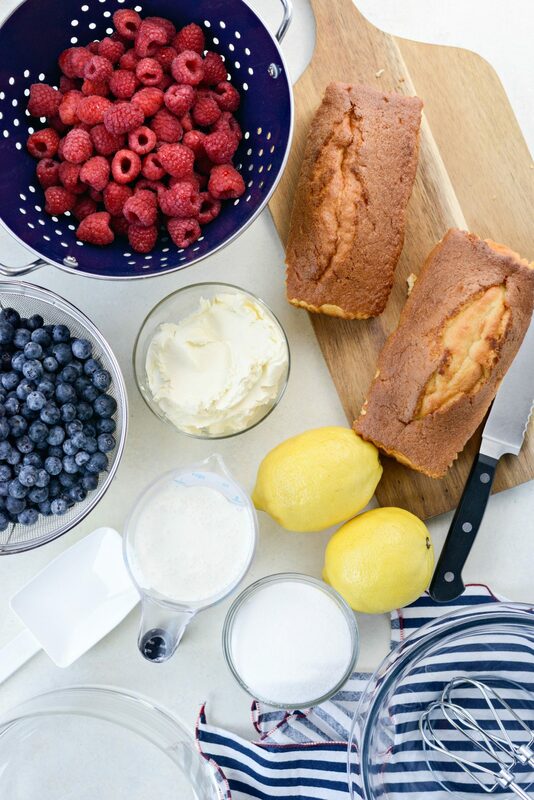 The white is the fluffy mascarpone whip that separates the berries from the lemon syrup soaked pound cake. And if you know me at all, you know lemon and I are like this (insert appropriate emoji). 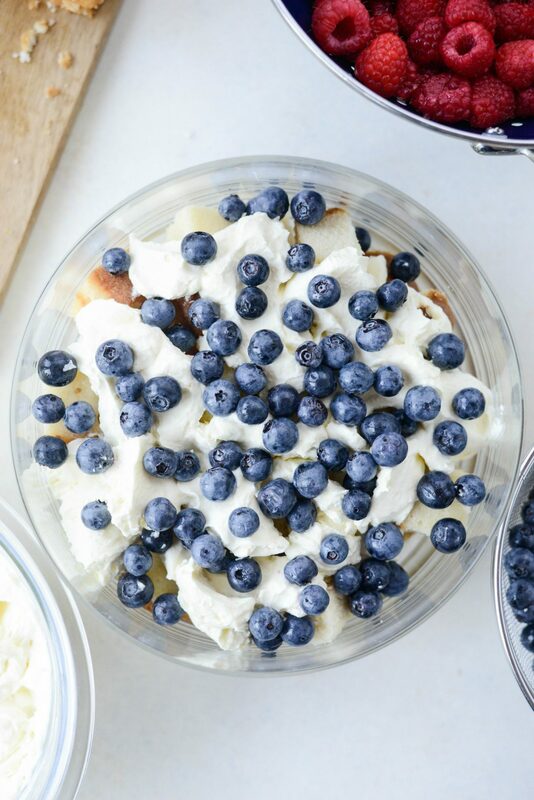 Not to mention that lemon and berries and cream is a match made in dessert heaven. I’m supposed to bring taco salad to our families 4th barbecue. But I may whip this ditty up as well. You should too! 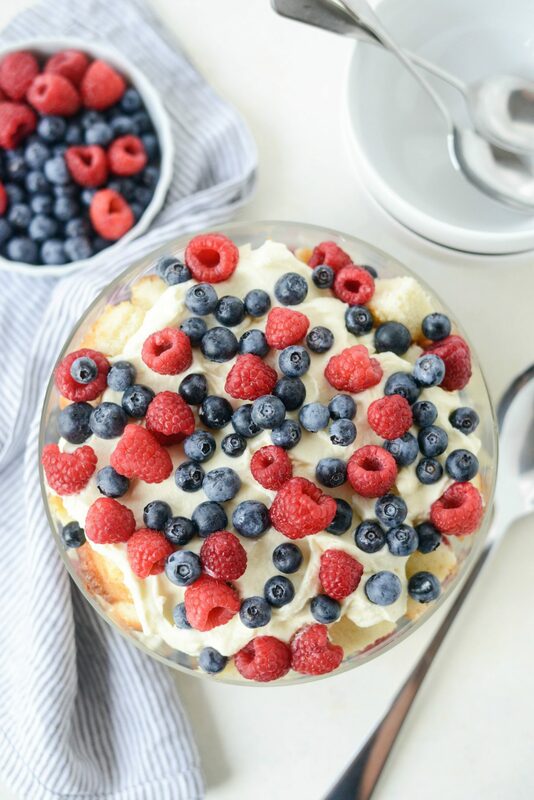 To make this Red, White and Blue Trifle, you will need 1 to 2 pound cake loaves (homemade or store-bought if you’re in a pinch– 1 standard loaf or 2 small loaves), lemon, sugar, mascarpone cheese, heavy cream, fresh blueberries and raspberries. 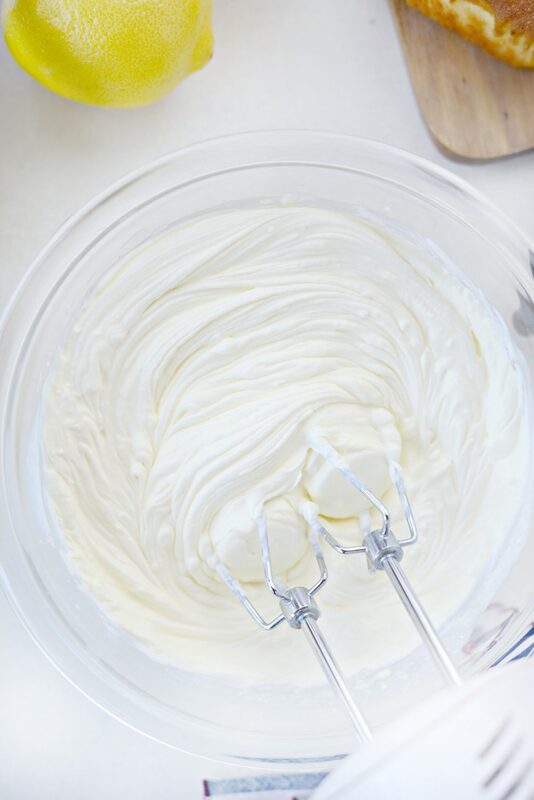 To make the mascarpone whip; in a medium bowl combine 1/3 cup sugar with 1 cup of heavy cream and 8 ounces softened mascarpone cheese. Using a hand mixer, blend until fluffy and no lumps remain. Cover and chill until ready to use. 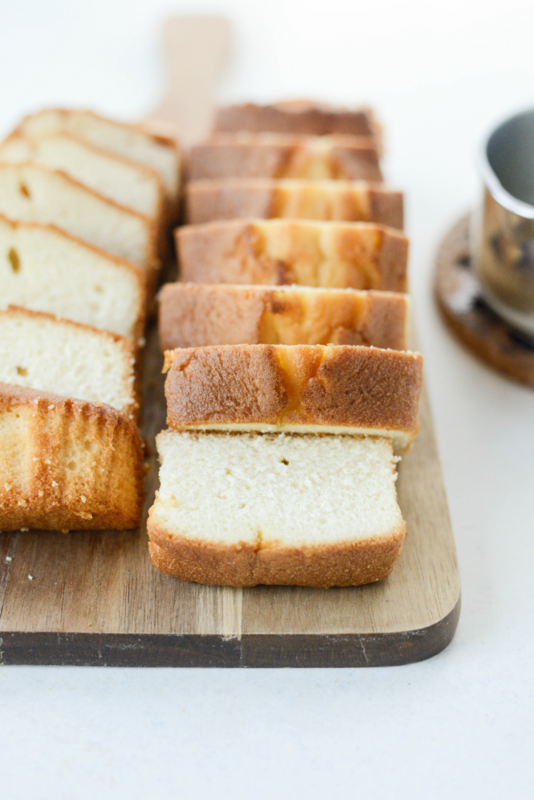 Next, slice the poundcake into thick, 1-inch slices and set aside for a minute. 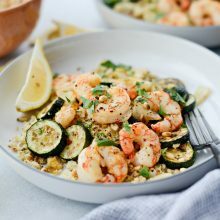 In a small saucepan, combine 1/4 cup of granulated sugar with 1/4 cup freshly squeezed lemon juice and 1 teaspoon lemon zest. Heat on medium-low, stirring until the sugar is dissolved and you have a syrup. Do not boil. 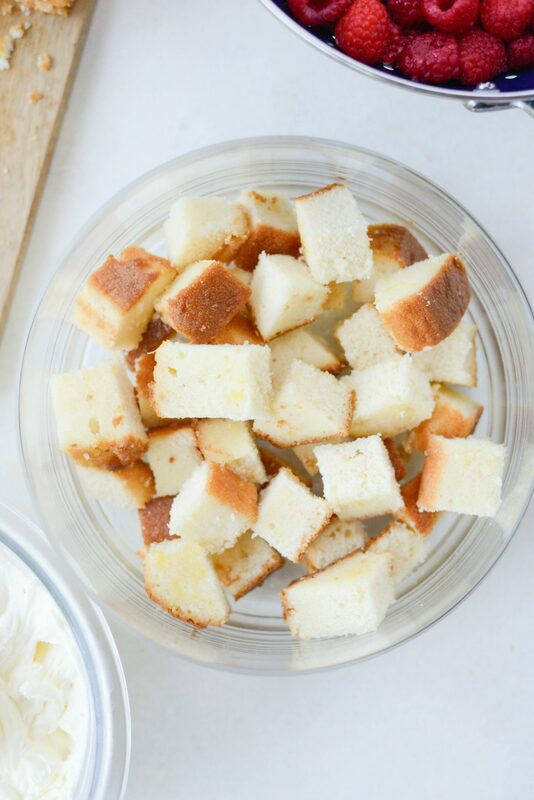 Brush the lemon syrup on both sides and the tops of each slice of pound cake, then cut into 1-inch cubes. 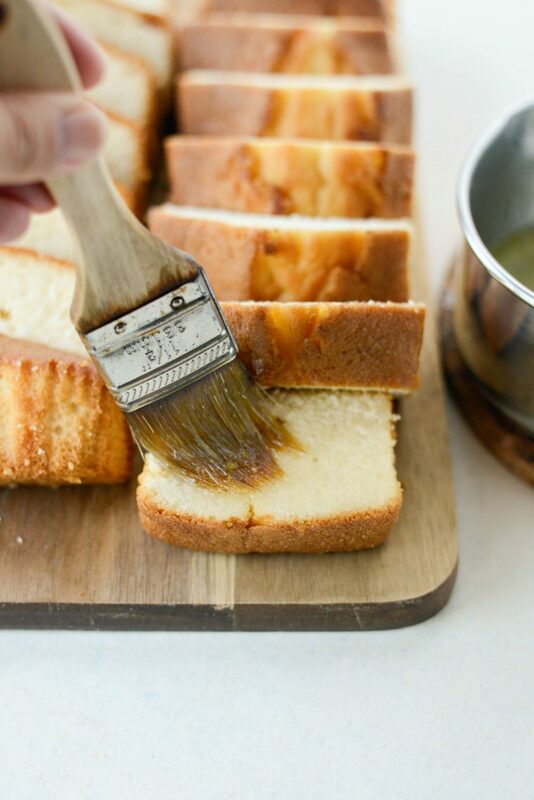 Then using a large spoon or spatula, drop half of the mascarpone whip in large dollops over the pound cake. …and half of the raspberries. Repeat with the remaining pound cake, mascarpone whip and berries. Now let’s be real. 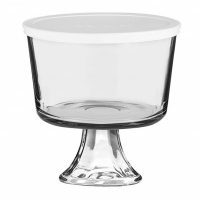 There is absolutely no way to serve this elegantly. I tried. Really, I did. But there’s just no way it will happen (see below photo) so just scoop and serve and don’t think another thing about it. 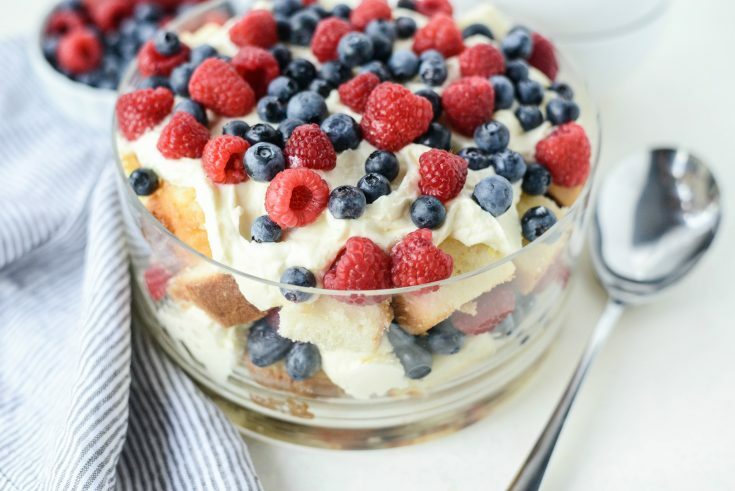 Because the lemon soaked poundcake with the creamy mascarpone whip and tart, sweet berries is absolutely decadent yet light and refreshing– who cares how it looks, really? 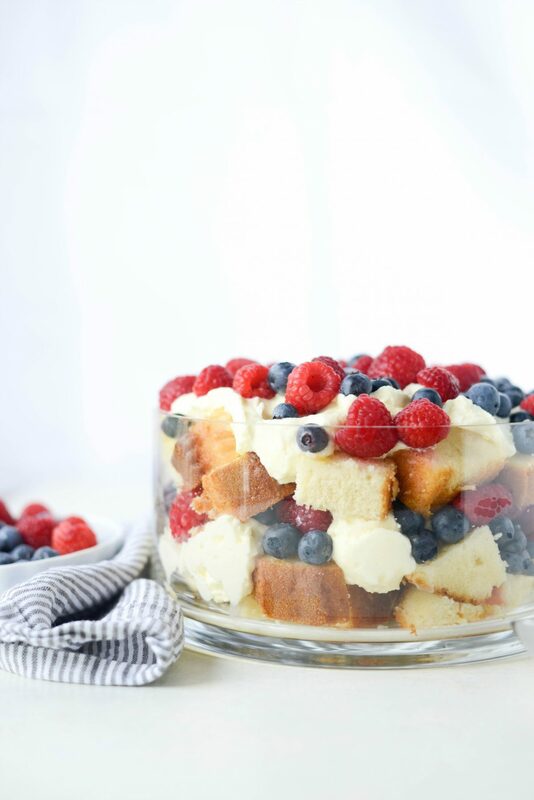 This Red, White & Blue Trifle is perfect for summer and even more perfect dessert for this 4th of July. In a medium bowl combine the mascarpone cheese with heavy cream and sugar. Use your hand mixer and blend on low to medium speed until smooth and no lumps remain. Cover and chill until ready to use. 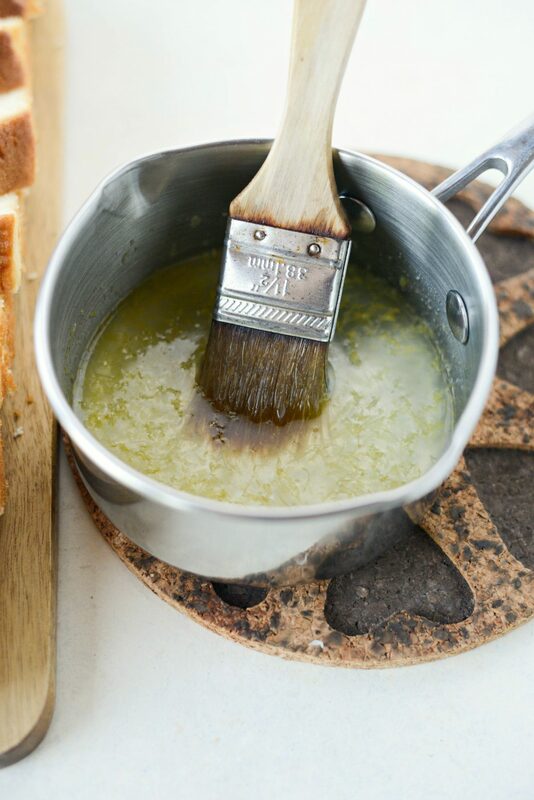 In a small sauce pan combine the 1/4 cup sugar, lemon juice and zest. Heat on medium-low and stir occasionally until the sugar dissolves. Do not boil. 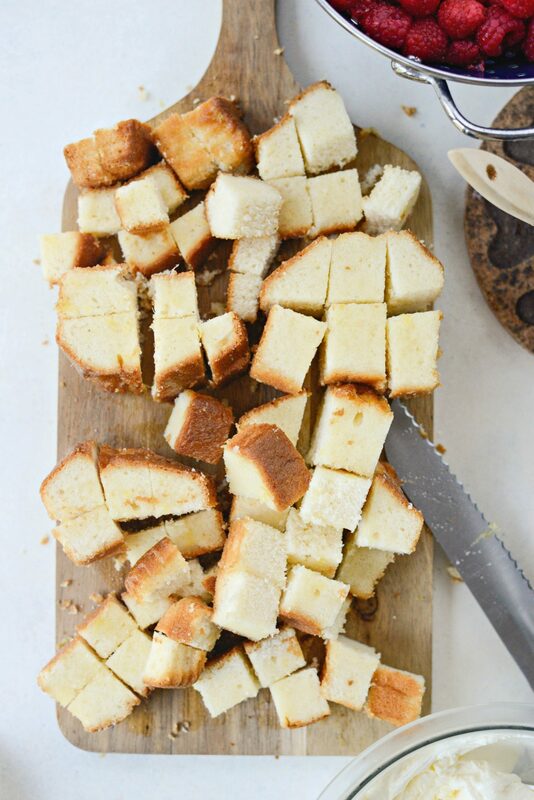 Brush both of the sides and the tops of the poundcake slices with the lemon syrup, then cut into cubes. 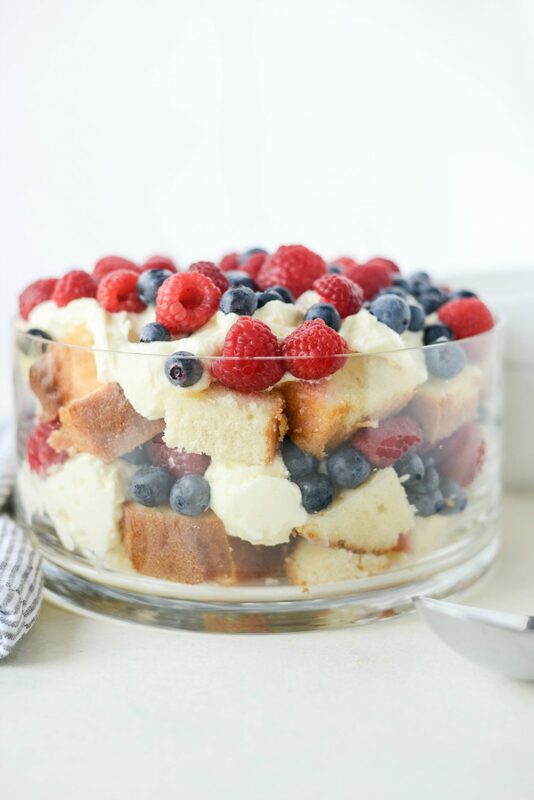 Place have of the lemon syrup soaked poundcake into a trifle dish or equivalent. 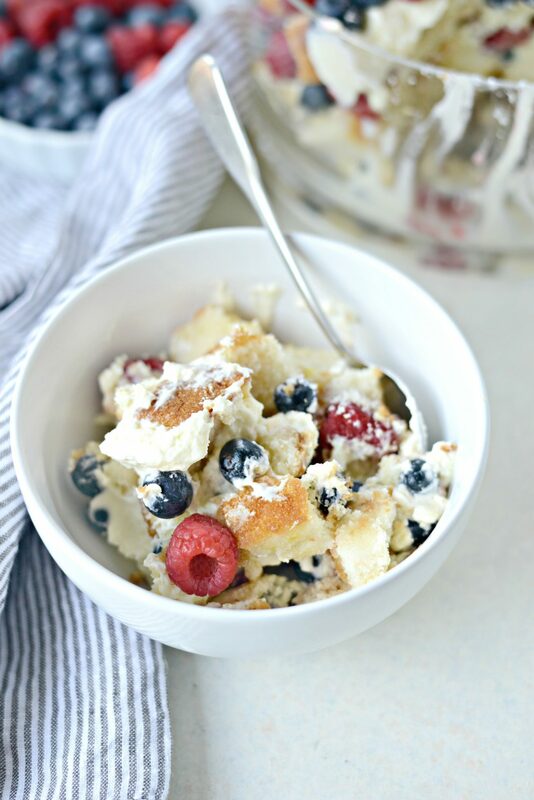 Then using a large spoon or spatula, drop half of the mascarpone whip in large dollops over the pound cake and sprinkle have of the blueberries and raspberries. Repeat with the remaining ingredients. Love trifles!! 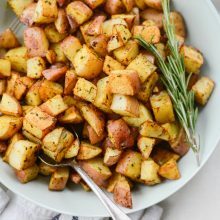 This looks SO perfect for our holiday BBQ! 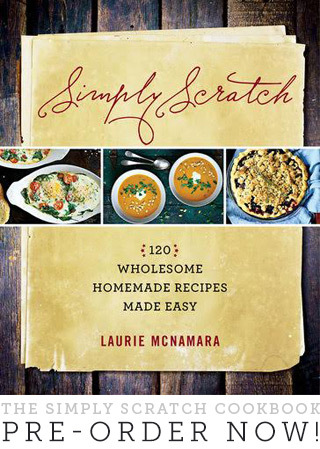 Can”t wait to try it… Thanks, Laurie! Happy 4th of July, Jane! Enjoy!